Applique has become one of my favorite techniques in machine embroidery. Designs are now so inclusive, that even the least experienced among us can easily create beautiful applique their first time out. If you follow my blog, you may have seen several projects I created with this embroidery design. One is a traditional applique project while the other two are freestanding appliques. 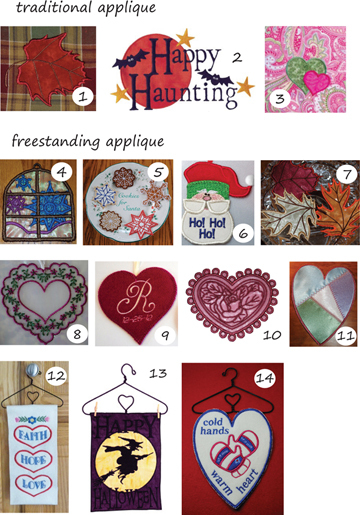 Applique can be used on clothing, quilts, and home decor or they can become ornaments or decorations when created as stand-alone pieces. I do love your ideas. Sew many things can be done with applique!